Swinderman has been an officer and chair of numerous Conveyor Equipment Manufacturers Association (CEMA) standards writing committees, and has served as chair, editor and driving force behind the Sixth Edition of the CEMA Belt Book: Belt Conveyors for Bulk Materials. The new volume is a collaboration of experts with vast experience in bulk material handling, designed to educate readers by identifying hazards, danger zones and unsafe work practices around conveyors, helping raise awareness among management, operators and maintenance personnel. Content on Hazards, Hardware Solutions, Safe Work Practices, Risk Assessment and Safer Conveyor Construction leads to summary discussion of the return on safety investment and how to measure the payback. In the section on Work Practices, the authors cover working safely around conveyors. They highlight fugitive material and its relationship to cleaner, safer and more productive conveying, as well as the importance of safety training and standard operating procedures to reduce risk, such as blocking the belt against motion. “We summarize international standards and regulations from around the world and offer suggestions for best practices,” added co-author and primary editor Andy Marti. The section on Building Safer Conveyors highlights ways that safety can be “designed-in” when engineering new systems and retrofitting existing conveyors, including observations on how conveyors could/should be made safer. The following section on Payback provides readers with information on the accounting methodology for assessed risk, including analysis of the true costs, the Return on Conveyor Safety (ROCS) investment and projected savings. 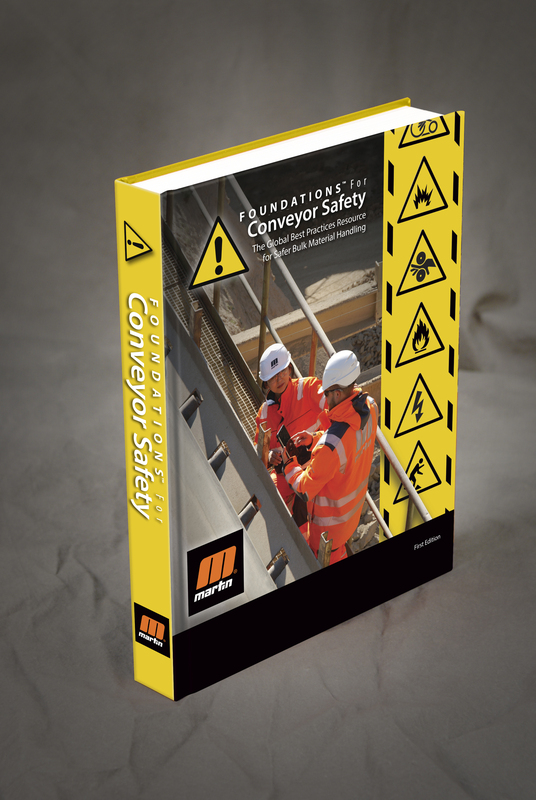 Foundations for Conveyor Safety will be available to Martin Engineering customers and by request -- in print and digital formats -- and will be used in conjunction with Foundations 4 in the company’s conveyor safety training classes. Founded in 1944, Martin Engineering is the global leader in making bulk materials handling cleaner, safer and more productive. The company supplies conveyor products and flow aids around the world for a wide variety of bulk material applications, including coal, cement, aggregate, biomass, grain, pharmaceuticals, food and other materials. The firm is headquartered in Neponset, IL, offering manufacturing, sales and service from business units in Brazil, Canada, China, France, Germany, Indonesia, Mexico, Peru, Russia, South Africa, Turkey, India and the UK, and under exclusive license with ESS Australia.